It's always best to use genuine Volvo or at least a reputable OEM brand. The green caps provide for optimal engine operating conditions in 700/900s. Some people believe the lower pressure (240) black cap doesn't stress the plastic sides and fittings of the rad tank as much, especially in a hot turbo engine compartment and especially as the rad ages. With that thinking in mind I've decided the trade off is worth it and use a black cap in my turbo, but have kept the green cap in my NA. Remember that the higher pressure caps prevent system boilover in high temperatures and allow higher engine operating temperatures, important for good fuel economy. Do not forget to tighten the power steering fixing nuts. Also since the system is drained, changing the thermostat (if it's been a while) is good insurance. Inspect the hoses as well for soft spots, cracked rubber on the ends, etc... If you're going to reuse the coolant strain it through a piece of fabric before you put it back (remove the bigger particles.) Bleed air out by loosening the thermostat housing. Give yourself a solid afternoon, this is an easy job if you're not rushed. Electrolysis Failures Due to Faulty Grounds and Electrical Components. [Radiator Reporter August 1998: "Electrolysis Problems Continue to Mount", excerpted] Cooling system electrolysis is becoming a frequent problem. Electrolysis occurs when electrical current routes itself through the engine's coolant in search of electrical ground. Current can be introduced into the cooling system in many ways, but the two most common causes are a poor ground to the radiator's electric cooling fan, or a poor ground from the starter motor and engine block to the battery. Any vehicle with accessories bolted to the radiator support or to a nearby component is also a good candidate for electrolysis. Electrolysis is a fast-acting menace that attacks not only radiators and heaters, but can destroy an entire engine in a mere 20,000 miles. 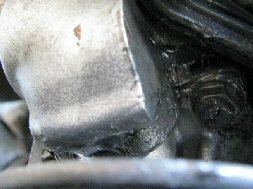 Though a small amount of measurable voltage can be detected in most engine cooling systems, due to reactions between the coolant and cooling system metals, the detected voltage should never exceed a tenth of a volt in vehicles equipped with aluminum engine blocks and/or cylinder heads.A poorly grounded engine and starter motor can zap enough current through the cooling system to blast apart a heater or radiator in a matter of weeks or even days, depending on how often the vehicle is started. A partially grounded electric cooling fan, on the other hand, may only shoot a small percentage of its supply voltage through a cooling system, and the effect may take months to reveal itself. Evidence of electrolysis includes unexplained and/or the recurring pinhole leaks in a radiator or heater. Pinholes may form anywhere along the tubes or tank walls, but damage is often concentrated at tube-to-header joints, or in the tube walls near the center of the core, where the electric cooling fan mounts come in contact with the core. To test for electrolysis, connect the negative probe of a digital D.C. voltmeter to the battery's negative post. Then submerge the meter's positive probe into the coolant at the filler neck. Be sure that the positive probe does not touch any metal. Next, note the meter reading, which should be no more than 0.10 volts ([Ron Davis Radiator]: Voltage of zero to .3 is normal in a coolant of cast iron engine. Such an engine will be destroyed with time by .5 volts, and engine manufacturers are reporting .15 volts will destroy an aluminum engine.). If a higher voltage is detected, methodically shut off or disconnect one electrical component or accessory at a time while watching the voltmeter. When the voltage reading drops to zero, you've pinpointed the electrical component with the defective or missing ground. If you test for and detect an AC voltage, this is due to static electricity. Since electrolysis might occur only when a certain component is energized, have a helper switch each vehicle component on and off while you observe the voltmeter readings. To check components or accessories that don't have an on/off switch, use a long jumper wire connected to the battery's negative post to provide a temporary ground to each electrical accessory. Ground each component with the jumper wire and watch the meter. If the jumper wire restores a missing or faulty ground, the meter will drop to zero. Be sure to check for intermittent voltage surges generated by the starter during cranking. To do so, watch the meter as you crank the engine. Any jump in voltage during cranking indicates a loose, faulty, or missing engine ground. Any electrical device with a huge current draw, like a starter motor or radiator cooling fan, will chew up a cooling system far faster than a trickle of voltage from a poorly grounded underhood relay or other low-amperage device. One telltale sign of electrolysis and/or electro-chemical corrosion is discoloration of the affected area. Aluminum components usually turn black and pitted, while copper/brass components are likely to develop a blue-green corrosion byproduct. Unfortunately, bad coolant can cause similar discoloration, so a blackened PTR core doesn't always mean electrolysis is to blame, but it should raise the possibility in your mind during diagnosis. [Tip] You can solve the problem for particular components by adding redundant ground wires of 16-gauge copper mounted with hose clamps on the component and a screw to body sheet metal.